Michael O’Halloran had always worked in kitchens, including those in some of Philadelphia’s best-known restaurants like White Dog Café in University City and Fork in Old City. But in 2002, he decided to leave that career behind him and follow in his father’s footsteps: he enrolled in a full-time MBA program at Drexel LeBow. A year later, with his new degree listing concentrations in finance and economics in hand, he accepted an analyst position at the world’s largest pharmaceutical consulting firm: IMS Health in Plymouth Meeting, Pa.
About two months later, she called him. Her executive chef of 20 years left abruptly, and she needed someone to run her kitchen. She offered O’Halloran the job of executive chef. So he said yes. He and his wife, Sophia, were living in Old City at the time, and O’Halloran started to dream about utilizing his MBA in a different way: opening his own place. When the former home of a nearby restaurant called Blue In Green — he describes it as a “hipster breakfast place before hipster breakfast places existed” — went up for sale in 2006, he took notice. Someone bought it in a snap. He kept his eye on the location on North Third Street. A new restaurant opened and didn’t even make it six months. He jumped at the opportunity by making a quick offer, which was accepted. 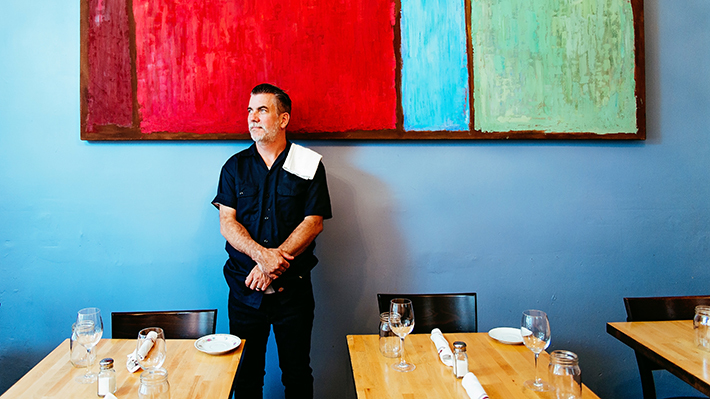 He opened his own restaurant, Bistro 7, four weeks later, in 2007. Last year, O’Halloran decided it was time for an update to both the décor and the menu. The updated look is clean and modern; relaxed yet upbeat. Gone are the tablecloths and green walls. They have been replaced by blues and grays, a large abstract painting and butcher block tabletops. The menu also changed to lend itself to a more casual dining experience. O’Halloran says he got bored of offering a 10-course tasting menu. His new, less formal menu format includes small plates, which O’Halloran says lend themselves to more creativity in his kitchen. Many are only four or five bites, so he makes the flavors very impactful. Also, the small plate format allows patrons to try as many things as they want. The duck liver mousse is still on the menu. Other current offerings include lamb merguez meatballs, tea smoked duck breast and ‘Nduja braised clams. His wife’s family is from Hong Kong, which also influences his menu (for example, the ahi tuna with puffed red rice, hijiki and sesame aioli). LaBan gave the BYOB a very impressive three-bell rating. “I probably would not be in business now if I didn’t get my MBA,” he says. LeBow’s Institute for Strategic Leadership Student Scholars recently presented the results of their consulting project before the full board of the Garces Foundation.